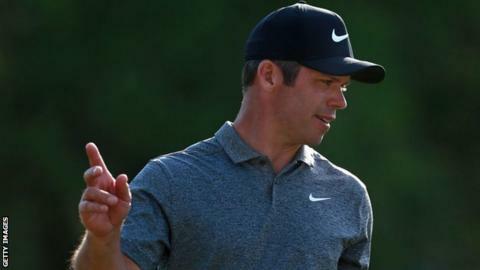 England's Paul Casey will take a one-shot lead over world number one Dustin Johnson into the final round as he bids to defend the Valspar Championship. Casey, 41, carded a three-under-par 68 in his third round at the Florida course despite a final-hole bogey. Fellow American Jason Kokrak's hole-in-one on the 15th helped him to third on seven under, one ahead of Luke Donald. Englishman Donald has made only 10 starts in two seasons because of a back complaint but he made birdie on the last hole to end one under for the day and remain in contention. The former world number one has not won on the PGA or European Tour since 2012, while Casey ended more than three years without a victory at this tournament in 2018 but has no titles since. Elsewhere in the field, South African Louis Oosthuizen moved into contention at five under par after sharing the lowest round of the day with Kokrak - a five-under 66. Casey carded a final round of six under par to win the tournament by a shot from Tiger Woods in 2018; there are currently 19 players within six strokes of his mark of nine under going into Sunday's final round.